Just as the prophecies foretold, Cave Story developer Studio Pixel's latest game is now available on PC. 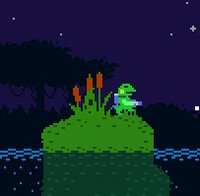 Kero Blaster brings more side-scrolling action to the platform, as its froggy hero attempts to subdue a legion of bizarre creatures attempting to disrupt his company's business. Kero Blaster is available exclusively via Playism, in both a standard version for $7.99 and a version bundled with a 24-track Kero Rhythm soundtrack album for $9.99. You can also play Pink Hour, a free prologue starring our hero's pink co-worker. Joseph Luster is the Games and Web editor at Otaku USA Magazine. His blog can be found at subhumanzoids. Follow him on Twitter at @Moldilox.